I really like the stamped image...and you colour choices. What a great card! The colors, the layout, the stamps...perfect! I made four cards in under 45 minutes using this sketch. 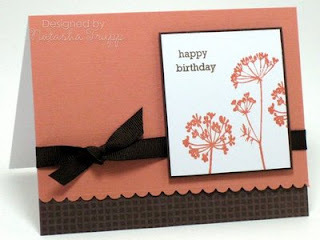 You can see them here: http://susansdayoffcreations.blogspot.com/2009/04/flowers-for-lydia.html. Thanks again for sharing these great CAS ideas. This is one of my favorite layouts!